This paper presents a new zero voltage switching current-fed DC-DC converter with high voltage gain. In this converter all switches (main and auxiliary) turn on under zero voltage switching and turn off under almost zero voltage switching due to snubber capacitor. Furthermore, the voltage spike across the main switch due to leakage inductance of forward transformer is absorbed. The flyback transformer which is connected to the output in series causes to high voltage gain and less voltage stress on the power devices. Considering high efficiency and voltage gain of this converter, it is suitable for green generated systems such as fuel cells or photovoltaic systems. 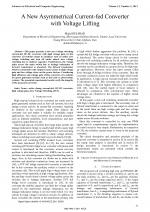 The presented experimental results verify the integrity of the proposed converter. 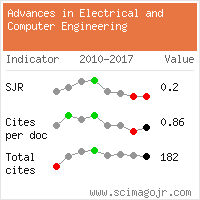 Modelling and Simulation of Fuel Cell Dynamics for Electrical Energy Usage of Hercules Airplanes, Radmanesh, Hamid, Heidari Yazdi, Seyed Saeid, Gharehpetian, G. B., Fathi, S. H., The Scientific World Journal, ISSN 2356-6140, Issue , 2014. Website conception, design and maintenance by Eugen COCA. Content updated on 28 Feb 2019. Site engine updated on 28 Feb 2019. This page was generated on the server in 0.016 seconds and loaded in your browser in > seconds.